Hey, Everyone! 2823 is back and with a bang! This year’s game is quite the challenge and since its release we have been hard at work on it. If you do not know about this year’s game you can see the game animation below along with updates about what we have been doing since kickoff! We have put a lot of time and effort into our prototypes thus far and we will see that continue until at least the end of this week as we perfect them into mechanisms to go onto our chassis. The first mechanism that we began working on is the mechanism to pick up and place gears. The original goal of this mechanism was not only to catch and carry the gear but also to do so from odd angles. The major reasoning behind such design choice was due to the fact that we want our cycle times to be as low as possible. Having a gear mechanism that can work within many ranges allows us to be within a wide margin of error which in turn allows for quicker turnaround and cycle times. Check out video of the mechanism prototype below. The climber is one of those mechanisms that we wanted to prototype as soon as possible. We feel that this mechanism has a high value and will set teams apart while it also has the potential to decide crucial matches. One thing that we did take into account is that we can bring our own rope. With this being an option in this years game we believe that it can easily be used to our advantage by designing the climber around a rope of our choosing. We also want it to be quick and sturdy as our robot needs to remain on the rope for the points to be valid. Check out some video below. We have very recently begun design on our intake prototype. More information will come in a future post. For now, check out this video of last years robot intake on this years field elements. It surprisingly works pretty well. The shooter is a vital piece of our strategy. While it serves a seemingly simple task it can easily be one of the most complex things to prototype. We had a lot of thorough discussion as a team regarding our shooter. We realize that while it is important to be able to shoot from a fixed position it is also important to be able to do so rapidly and consistently. It is still an ever evolving prototype and we will keep you updated on its progress. We are glad to be attending the championships for the first time, but we need your help! Donate via our GoFundMe page. If you can’t donate, don’t worry. Spread the word through all of our social media channels! Aaah! It’s been so busy we forgot to post updates. Sorry about that, we will try to make post more frequently. Now on to the information you all want to hear. Stop build day is coming up! To be more exact it is February 23rd. That means that our robot has to be completely done and placed in a bag for our first competition in Duluth. We have made great progress on our robot and we will slowly release more information about our robot as it is being completed. Today we present the information about our chassis! The chassis is rolling with 12″ wheels which are attached by #35 chain and are in Tank Drive via 4 CIM motors and Vex Pro Gear Boxes. 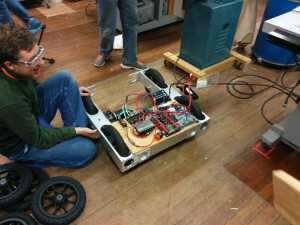 Here goes some photos and even a video of the chassis in action. It’s been a while since we have made an update so there is a lot of fun exciting news to tell you. First off we now have an FTC Team or First Tech Challenge. To put things simply, they make smaller and more compact robots than the FRC team, but it is very similar to the FRC Team in many ways. We call them the “The MicroScots!” They are team 10209. There season began in September and there first competition ever is on December 12th. The decision to have an FTC Team was made mainly on the premise that we usually don’t have many exciting things during the FRC Pre-Season. 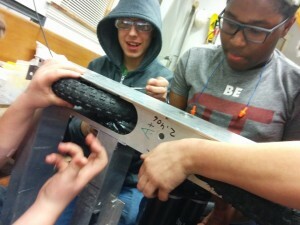 Thus a lot of the team members who join at the beginning of the year lose interest and don’t get the chance to see what robotics is really about. It also has been a great recruiting and learning tool for new members and has deemed to be a great addition to Highland Park’s Robotics Organization. 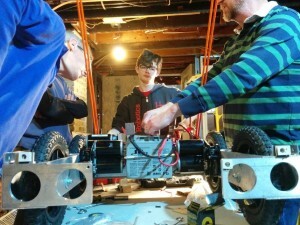 It is now Robotics season, and robot season is underway. If you are interested in joining the team, please sign up using this form.